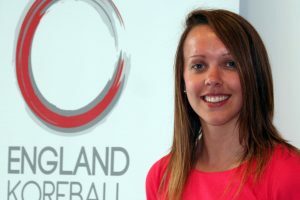 After 4 years and 5 months of dedicated service, Katherine Robinson has unfortunately decided to step down from the England Korfball Board. England Korfball chairman, Craig Gosling said: “Kath joined the board as our first ever independent director and quickly made an impact. Influential in defining our vision for a modern coaching strategy, she has made a massive contribution to the sport. “Successfully spearheading the development and launch of our Level 1 Coaching Award and more recently the Level 2. “Kath continually looked to evolve and develop offerings for our existing coaches through the launch of the Continual Professional Development (CPD) day and our Activator Programme. “Her achievement speaks volumes. Over the last five years, the coaching programme has developed and qualified over 400 coaches. “Kath’s enthusiasm, drive, wit and her friendship will be missed by everyone on the Board and the wider Korfball community. One positive is that Kath will continue to drive our Coaching strategy in her current professional capacity.